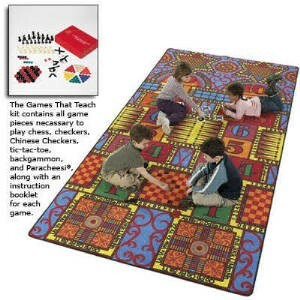 This beautiful carpet has a surface made for playing hopscoth, backgammon, Chinese checkers, checkres, Parcheesi®, chess and many more games that kids and adults love to play. Also on this carpet are the alphabet, numbers 1-10, and mathematical symbols. Games That Teach is made with Denistech technology, Force Five, Stain Shield, and Mircrogard.